World’s Finest: The Collection is a quarterly DC Comics mystery box full of officially licensed DC collectibles and gear! Each quarterly will have a specific theme and deliver exclusive items – including a brand new World’s Finest: The Collection figure line! This quarter’s box featured a lot of Flash-inspired clothing items, a few items for your bar, and a new figure. Short Sleeve Raglan T-shirt – Value $15-20? I love a good raglan shirt – and I think this design is all sorts of awesome – so I couldn’t be happier. That bright pop of yellow lightning bolts is a great design choice. Duffel Bag – Value $20-25? While you won’t be able to run as fast as The Flash, you can still arrive in style with this Flash-themed duffel bag. It’s a pretty basic duffel – just the one main pocket – and it’s s medium size. I’m thinking this could be a good one to keep in the car. 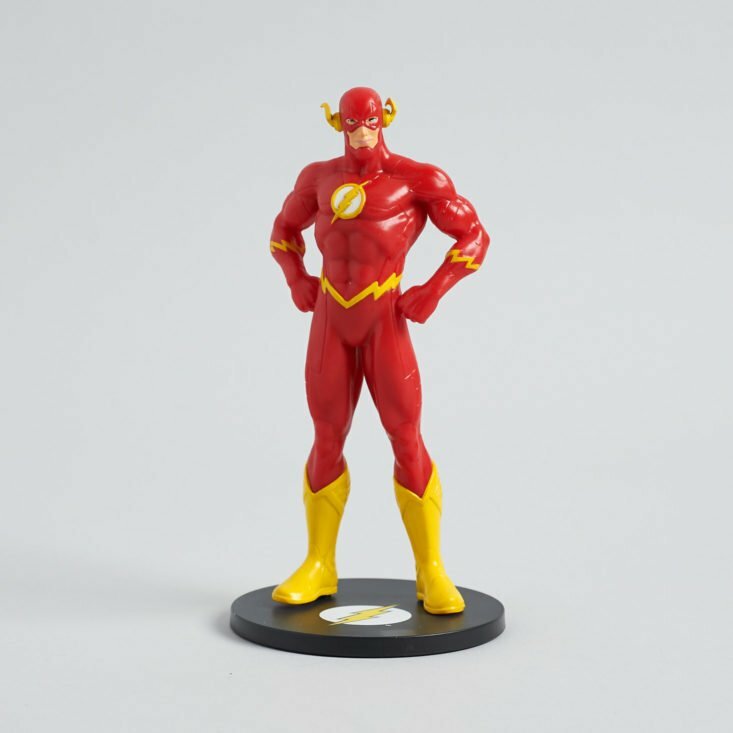 The Flash Vinyl Figure – Value $15-20? The new figure in the World’s Finest: The Collection line is, of course, The Flash. These each stand around 6 inches tall and have that DC Collectibles feel to them – and this one has one of the better paint jobs that I’ve seen from the line. While it’s just a basic glass – I love this speedy design. Coaster Set – Value $10-15? Protect your table while you’re using that new glass with Flash-inspired coasters. PVC Zipper Pull – Value $5? While this was a tiny item, I thought it was a fun addition – you can add a little Flash to any outfit, jacket, or backpack of your choosing with this little zipper pull. The clothing theme continues with the next two items. First, a pair of socks that feature The Flash’s logo around the calf. Knit Beanie – Value $15? Finally, keep warm during this cold winter with this Flash beanie. It’s a heavier knit hat and definitely does a good job of warming me up during the cold. Verdict: I’m always in for the figure in this box – but it’s hard for me to give my take on this one because I’ve never been the biggest fan of The Flash. I’d like to see them go back to creating more unique items as they’ve done in the past and with their other subscription lines. The items were well-designed for sure, but I wasn’t wowed by the overall concept by any single item. Can you still get this box if you sign up today? Yes. The current box is theme can be found on their homepage. What did you think of The Flash themed World’s Finest: The Collection box? They should have included a Flash drive.